Bradford UNESCO City of Film presents Bradford’s Armed Forces Past and Present in celebration of the Armed Forces. 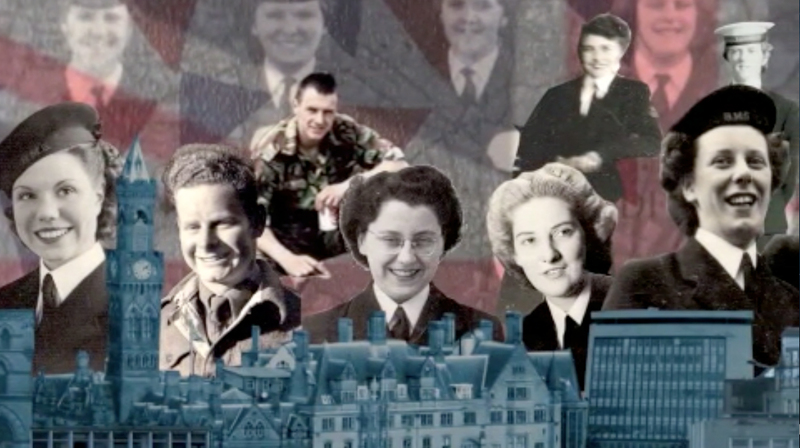 This short film reveals some of the inspiring stories of the men and women who served their Queen and country throughout the last century. Through a blend of interviews, animation and historical footage we see their stories come to life highlighting the impact and importance of the Armed Forces on individuals, communities and a nation. This film was made possible with funding from the Community Covenant Fund. The aim of the community covenant is to encourage local communities to support the service community in their area and promote understanding and awareness among the public. James Hargreaves was born and bred in Bradford. He joined the army as an apprentice in the second world war. James was a gun layer and chef in the army and has continued on into the Royal British Legion. Philip France was born in Bradford. His career in the army began during the second world war at 23 years of age. Philip joined the army as a Specialist due to his skills in mathematics. He continues his time with the army as a member of the Royal British Legion. The Women’s Royal Naval Service was the women’s branch of the Royal Navy. Formed in 1917 during the First Work War, members included cooks, clerks, wireless telegraphists, radar plotters, weapons analysts, range assessors, electricians and air mechanics. We are thankful to our Bradford Wrens; Eileen Parker, Jo Davanna , Kath Brey, Margaret Evans, Mary Thornton, Mavis Northrop. Mark was born in Cleckheaton, Bradford, and left for a career in the Army at 17 years old. He currently works at Fifteen Brigade Headquarters in York. Mark began his interest in the Army through the cadets, and during his time in the Armed Forces has learnt many skills from becoming fluent in multiple languages to deploying military tactics to aid peace keeping. Gerry joined the Bradford Royal Engineers when his parents came to live in Yorkshire. He began his life in the Army as a volunteer, and quickly progressed to gain many skills with a special focus of building. Gerry is now retired and is one of only two veterans who were part of the Normandy D-Day Landings. Stephen’s time in the Armed Forces began 23 years ago when he went from his home town in Howarth to join the Army with his friend. Although Stephen is now at the end of the his Army career he learnt skills in Arctic warfare amongst others and travelled the world.